← How’s that for a thank-you? 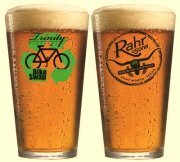 Two of my favorite local businesses, Trinity Bicycles bike shop and Rahr & Sons brewery, are teaming up Sunday for a bicycle swap meet at the brewery. Bicycles and beer! That’s a combination that’s hard to beat. Shop owners, cycling clubs, charities, frame builders and industry reps will be on hand for the event, from 9 a.m. to 2 p.m. at 701 Galveston Ave. on Fort Worth’s Near South Side. The brewery will be open for a special Bike Swap Tour and tasting from 11 a.m. to 2 p.m.
For $7, you get a limited edition Bike Swap pint glass and a tour of the brewery. And the beer is complimentary. Sounds like a great way to spend a chilly Sunday.